Home TRAVEL ABROAD Asia Destinations China-Thailand 2010 2/17/10 HEADING FOR THE HILLS TODAY AND TOMORROW!!! 2/17/10 HEADING FOR THE HILLS TODAY AND TOMORROW!!! 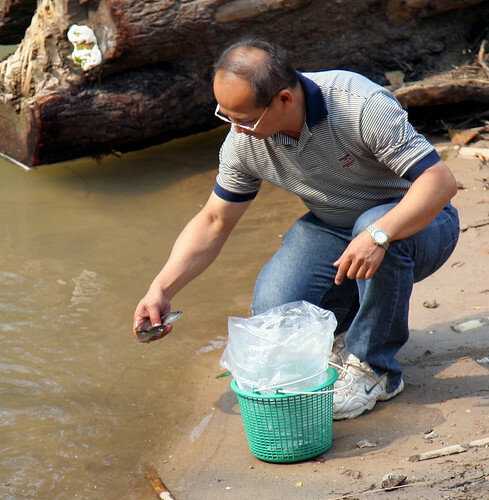 ABOVE: SERGEANT KAI “MAKING MERIT” ACCORDING TO BUDDHIST TRADITION AND RELEASING LIFE BACK INTO THE WILD. Today we head for the hills with our private guide Sergeant Kai to visit the Karen Hilltribes as well as the Hmong Tribes for some incredible photo opportunities. On our last trip Kai understood how important it was for us to stay off the beaten touris path and he did NOT disappoint!!! 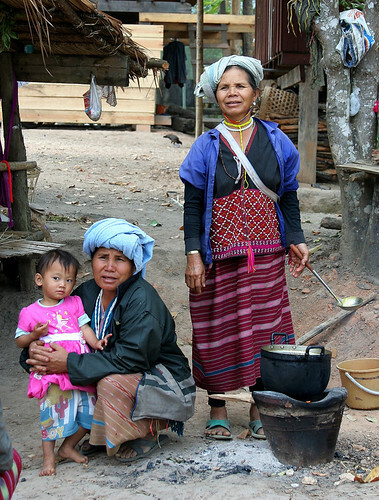 One of the most memorable moments on our trip to Thailand was when Sgt Kai took us into the mountains where the Hmong and Karen Hilltribes resided to get a REAL taste of tribal life. We were brought to a number of very out of the way villages where few visitors are lucky enough to see. Sgt. Kai was absolutely the BEST. He knew exactly what we wanted to see and delivered 200%!!! The cool thing was , he enjoyed our day in the hills as much as we did. He has a true passion for the indigenous tribes of his country and it shows. This video I pieced together was done with my little Canon IXUS 65 by Diana while stood by and took the still shots with the Canon Rebel XT and a 105mm zoom. We stood VERY still so as not to spook the cattle and water buffalo as they made their way up from the rice paddies in the valley to the hill side where the villagere/herders brought them to be safe for the night. The memories in my head of that 20 minutes or so where the procession filed by us….bamboo cow bells clanging and shepardess calling to her flock………..well it was enchanting as well as primal. All we could think is how we hoped this wouldn’t change………..but sadly for tradition’s sake, the village had just gotten electricity the week before. For their comfort it is most certainly a good thing. Still it made Diana and I sad to think that we may be the last outsiders to see this village at it’s most pristine and authenthic state. This is unlike any puppet performance you have ever seen. Instead of remaining behind screens during the performance, the puppeteers are an integral part of the show. Traditional puppets give performances of the Ramayana (or Ramakien in Thai), the Indian epic tale, drenched in all kinds of intriguing plots. If it sounds terribly highbrow and boring, it isn’t. The choreography and coordination of the puppeteers, as they move around the stage, is mesmerising. Each puppet is controlled by three puppeteers visible on stage, who work together in perfect unison to produce the incredibly lifelike human movements of each puppet. The puppeteers are classically trained dancers who imitate the movements of the puppets to literally bring them to life, capturing gestures and nuances. During the performance, the puppets are brought out into the audience. Hanuman the mischievous monkey king moves among the audience, while the female puppet cleverly charms the men. Even teenagers in the audience (dragged along by their parents for their obligatory dose of Thai culture) will be suitably impressed. The Joe Louis Puppet troupe is the last in Thailand to still perform the ‘Hun Lakhon Lek,’ traditional small puppet play. Once an exuberant celebration of culture, this intricate art form declined after the reign of King Chulalongkorn and almost died out. Joe Louis (originally a mispronunciation of Liew) learned the skills as a child from his parents and began to make his own puppets, giving performances throughout the country. When he died, his wife continued with the theatre. The art form is now continued by his seven children, and in the process of being passed on to his grandchildren. Outside in the foyer are displays of the puppets, exquisitely decorated with coloured glass, a history of this incredible art and lots of information. The show lasts an hour, just long enough to appreciate the subtlety and skill of the performance. The foyer contains an area which documents the history of the theatre and a display of how traditional masks are made. Located at Suan Lum Night Bazaar (corner of Wireless and Rama 4 Roads), it is the perfect excuse to combine a visit to the theatre with a night-time shopping trip. The Night Bazaar is a smaller version of the famous Chatuchak Weekend Market, selling crafts, souvenirs, clothes, lighting, candles all kinds of lifestyle items, and much, much more. Be sure to check the ipadio audio updates and video updates below as the day progresses !! A new blog post will be coming after our dinner tonight with pix and stories!! your hilltribe trek looks so amazing. What a fascinating culture. Have to say I had tears in my eyes when I saw the cute pups huddled together, hope they are taken care of! And the little bird…. I am way too much of a sap when it comes to animals. Those puppets are very cool too! Wow Sandra…really neat videos! I especially love the fabulous puppets!